In the late 80’s and 90’s I worked with a lady at a South Florida hospital. She was born in Montreal, Canada around the year 1910. She described how much of North America was covered in Chestnut trees until the blight destroyed nearly all of them by 1920. For the last 100 years most of our chestnuts have come from Europe and Asia – now scientists are within two or three years of reintroducing true American chestnuts that are resistant to the chestnut blight. The chestnut blight was accidentally introduced to North America around 1900, probably on imported Japanese chestnut nursery stock. In 1905, American mycologist William Murrill isolated and described the fungus responsible (which he named Diaporthe parasitica), and demonstrated by inoculation into healthy plants that the fungus caused the disease.By 1940, most mature American chestnut trees had been wiped out by the disease. 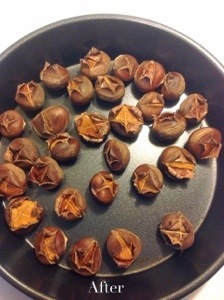 Infection of American chestnut trees with C. parasitica simultaneously appeared in numerous places on the east coast, most likely from Castanea crenata, or Japanese chestnut, which had become popular imports. Japanese and some Chinese chestnut trees have some resistance to infection by C. parasitica: the infection usually does not kill these Asian chestnut species. Within 40 years the nearly four-billion-strong American chestnut population in North America was devastated — only a few clumps of trees remained in California, Michigan, Wisconsin and the Pacific northwest. Because of the disease, American chestnut wood almost disappeared from the market for decades, although it can still be obtained as reclaimed lumber. It is estimated that in some places, such as the Appalachian Mountains, one in every four hardwoods was an American chestnut. Mature trees often grew straight and branch-free for 50 feet and could grow up to 100 feet tall with a trunk diameter of 14 feet at a few feet above ground level. For three centuries many barns and homes near the Appalachian Mountains were made from American chestnut. The root collar and root system of the chestnut tree have some resistance against the fungal infection; consequently, a large number of small American chestnut trees still exist as shoots growing from existing root bases. However, these regrown shoots seldom reach the sexually reproductive stage before being killed by the fungus. They only survive as living stumps, or “stools,” with only a few growing enough shoots to produce seeds. 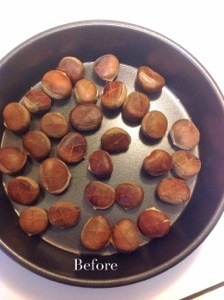 This is just enough to preserve the genetic material necessary to engineer an American chestnut tree using genes from any of the disease-immune Asiatic species to confer resistance to the disease. Efforts started in the 1930s and are still ongoing, in Massachusetts and many other places in the United States, to repopulate the country with these trees. Tad–great information! NC State is working on this project. 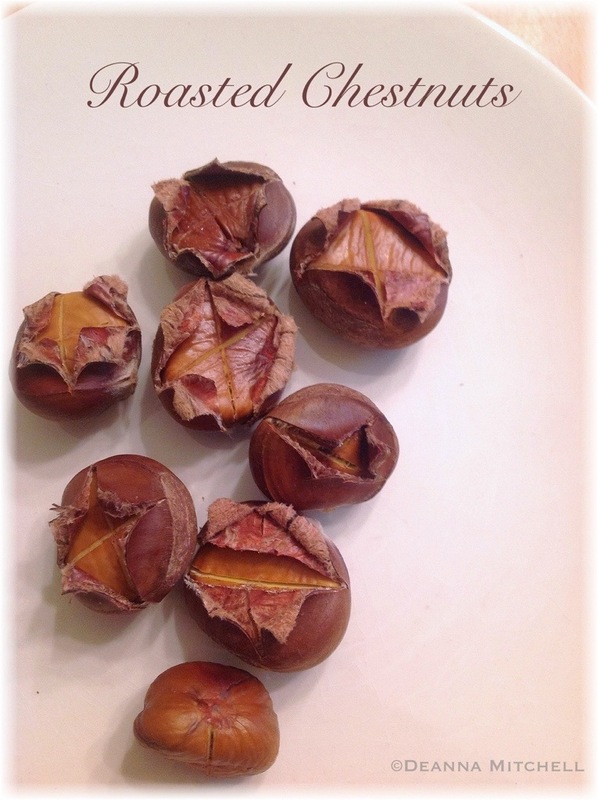 Not sure how these NC chestnuts differ from the original, but they are certainly tasty! Cool! Glad we can produce them here in NC! One of my favorite snacks for this time of year. I think it’s going to be one of my favorites, too!! !